I guess my blog had a spasm and would not let me finish the last post. So here are the last few cards for tonight. This cute card is from SVG Cuts Haunted Hemlock Cards set. 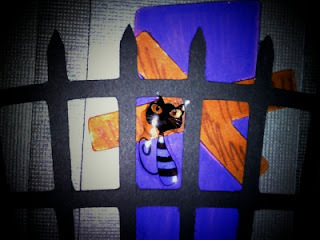 In the top picture you can see the little cat I added to the fence. I used glossy accents on the moon and the windows with moonshine in them. This fantastic digi stamp (Morticia) is from Simply Betty Stamps Spooky Hallow Digi collection. 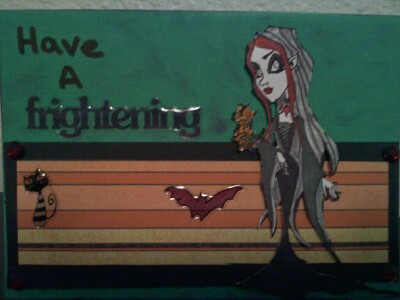 Thanks to some great tips from Cheri at Graphicat Creations I was able to cut all the little areas of Morticia. A cute chipboard embellishment finished off the Morticia card on the inside. And this cute, cute, cute witches hat card is another one in the Haunted Hemlock Cards collection at SVG Cuts. 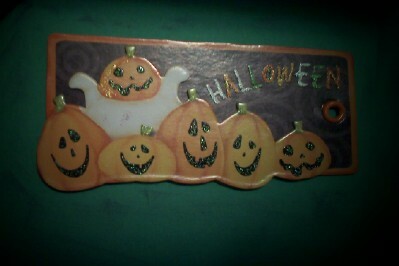 I used 3D Crystal Color Lacquer on a plain white card stock cut out of the buckle. Love the way it looks wet. Some stickles on the stars to give a little more bling. Well that's it for cards tonight. I hope to get these and the treat bags finished tomorrow! I have a lot more things to be working on but have to finish up Halloween goodies for the family first! awesome cards...love the hat card! Oh Kathy that turned out Great!! Im so glad I was able to help with your cutting. 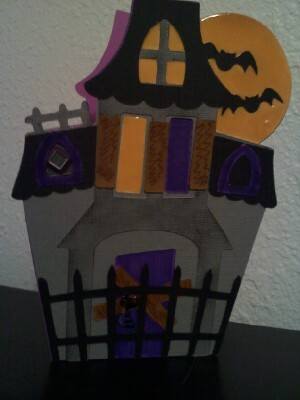 :o) I LOVE those shaped cards you've done too! Im gonna have to go check out those SVG Cuts. 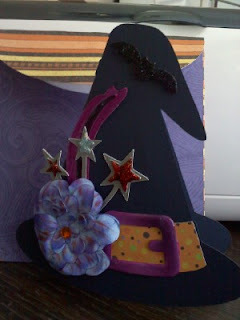 The witch hat is my favorite but I think I'd like it better without the flower, just the stars.